Cyberpunk 2077’s 50 minute long demonstration was viewable by the public for the first time a while ago and some are itching to find out more about CD Projekt Red’s first-person, open-world RPG. We’ve seen little of it, but we’ve heard a lot about it via interviews from the developers, and we’ve even done our best to hack the Gibson to reveal any extra information we can. Below you’ll find all of that, plus the usual announcements, trailers, and release date information. Regarding the game’s release date, we heard about it was a statement hidden within a glitched frame. “When we told you we would only release the game when it’s ready, we meant it. We’re definitely much closer to a release date than we were back then :), but it’s still not the time to confirm anything, so patience is still required.” If you see any release date at this stage, such as the claimed Q4 2019 in recent days at the time of writing, take it with a mountain of salt. In fact, CD Projekt Red even sent a rather festive message about it recently. Cyberpunk 2077 is a first person RPG based on the pen and paper RPG – Cyberpunk 2020 by Mike Pondsmith. You can of course judge for yourself with the footage above as to whether the game is your jam, and there’s some important caveats that the game’s director Adam Badowski wishes to stress about how it is all subject to change. For another opinion there is also Brendan’s first impressions from the E3 demonstration. The 50 minute demo was full of things that left his brain “…feeling very fizzy.” The player will take on the role of V, an otherwise completely customised character as the player would be able to choose their own gender, skin colour, body shape, etc. There will also be a background that you can choose at the beginning that leads to certain events unfolding in certain ways based on your upbringing. Also, it’s worth noting that you can give them a proper name should you so wish, but V is the alias they go by. Cyberpunk 2077 does use three of the existing classes found within Cyberpunk 2020. Netrunners are your computer hackers, able to slip through the toughest security measures or uncover corporate secrets. Techies meanwhile are described as “renegade mechanics”, preferring to tinker with more physical contraptions and the human body rather than the internet. For those that just want to punch things though, there are the Solos who are the hired muscle; combat focused with the uncanny ability to notice any dangerous traps or generally avoid harm. Cyberpunk 2077’s interpretation of the three classes hasn’t been revealed yet, but you’ll choose one or a mix of the three as the game progresses. Judging from our preview and the demonstration, Cyberpunk 2077 is in first-person, complete with a standard HUD, and is a bit of a mix between Grand Theft Auto meets Deus Ex with its ambitious amount of things to do. It will be primarily involve melee or gun-based combat, with V being somewhat nimble on foot and possessing abilities to aid in their survival, but this is not the only way to solve a particular problem. Numerous times during the demo, there are moments where the player has dialogue options that use their more sociable skills to defuse any potentially fatal situation. Of course, there’s no guarantee that things will go smoothly – this is Cyberpunk after all. Since it’s based on an already existing system, it includes a lot of nods to the original Cyberpunk 2020 rules, including a stat for coolness which is to determine your character’s willingness to fight while wounded and your fighting ability under fire, as well as just how cool they are. Certain equipped items can also boost stats, such as the leather jacket that V puts on during the demo that has a boost to street cred – allowing for better vendor prices. V is also shown to obtain a spider bot that shoots enemies for you, as well as an off-screen helper to pinpoint enemies to shoot. Since E3, there have been a few murmurs that the game will feature multiplayer. After asking that question directly, Maciej Pietra had this to say. What easter eggs were in Cyberpunk 2077’s E3 trailer? There are little details and Easter eggs throughout the trailer to all things Cyberpunk. 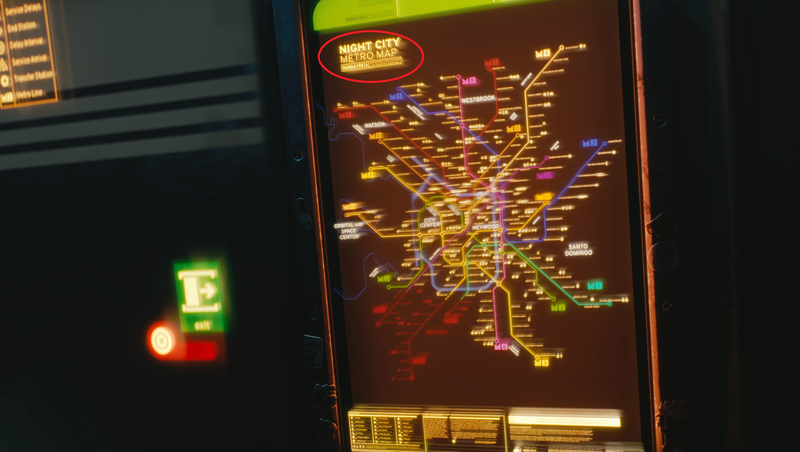 While trying to establish whether or not the Night City Metro map is an indication of whether or not the city the game is based on a real American city (it’s not, though it is west coast as they run on Pacific Time), I noticed a code underneath that says “N6MAA10816”. I’ve circled the location so you can have a look at the trailer with a much higher resolution. A quick Google search turned up results for Rutger Hauer’s character in Blade Runner as it’s Roy Batty’s serial number. This serial number is also shown in the taxi later in the trailer. There really isn’t a ton to go on here, which is a bit of a shame, but with the game in active development, there’s bound to be more details and trailers as the months and possibly years go on until the game’s finally released. We will be keeping this hub updated with any additional information that comes to light in the lead-up to its release and beyond.